Florida beach real estate...Can you find quality Florida beach property without depleting your bank account? It seems like once people visit here, they want to know if they can find quality Florida beach real estate at a discount price. Florida beach property went haywire between 2001-2006...then the shinola hit the fan. People got in over their heads, property taxes increased geometrically, and foreclosure became a legitimate reality. Beach real estate in Florida has always been more expensive than homes across the causeways on the mainland, but prices went to ridiculous levels in a five-year period. Now, many are over-priced and the owners have huge carrying-costs. You can find solid beach real estate, but you need to know it will take time, exhaustive checking, and skillful negotiating. The real estate nonsense you hear on late-night cable TV doesn't fly when you want to purchase Florida beach property in the real world. The concept of buying Florida beach real estate can't be some misty romantic vision that is hard to nail tight. You need to sit down and study the community where you want to live, know how big of home you want, decide if you want to live there year-round or rent it...and those are just the basic simple guidelines you should be thinking about. If money is no problem, well...there are plenty of desperate real estate agents and property owners ready to make your wish come true. To me, many of these Florida beach properties are $100K to $150K over-priced when you review prices from 1998-2001. A lot of these places appreciated in value (well, perceived value) in the speculation nonsense at the beginning of the new decade what normally took 25-30 years to reach. How can I get help finding quality Florida beach real estate? If you are going to negotiate the beach real estate minefield of present day, you need solid information with step-by-step instruction. To me, the best authority on investing/purchasing Florida real estate is former Marine, Thomas Lucier. His inexpensive books are full of checklists, legal warnings, specific questions to ask, and how to perform your due diligence and inspection on a property of interest. 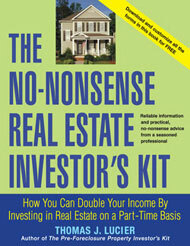 I'm sure some of you are looking at the cover of The No-Nonsense Real Estate Investor's Kit and thinking, "Come on, man...I don't want to be an investor, I want to live in this place." Please stay with me here...if you are looking for a Florida beach property through the eyes of an investor, I doubt if you will get caught up in the emotional side of making a purchase that could mire you in financial and legal messes. You'll want to know how to limit your risk and liability before making an offer. You'll want to know how to determine the TRUE value of a Florida beach property...not the inflated one. And for sure, you'll want detailed information about how to buy Florida beach real estate at below-market price. An astute beach real estate investor covers all bases, exhausts the needed research, and knows exactly what legal and financial problems he does NOT want to face. For less than $15 (as of this writing) you can get as close to a graduate degree in property purchase without spending several years in college. Doesn't this make more sense than walking in the first real estate office you see on the beach and saying you want to buy a place? Return to Florida Beach Lifestyle home page from Florida Beach Real Estate page. Can you profit buying foreclosed homes on the Florida beach? Are Florida beach foreclosure auctions really that easy? What is the best way to purchase Florida beach foreclosures?